The state weather agency announced earlier that Bagyong Amang (Tropical Storm) has slowed down and continues moving to west towards eastern Visayas. 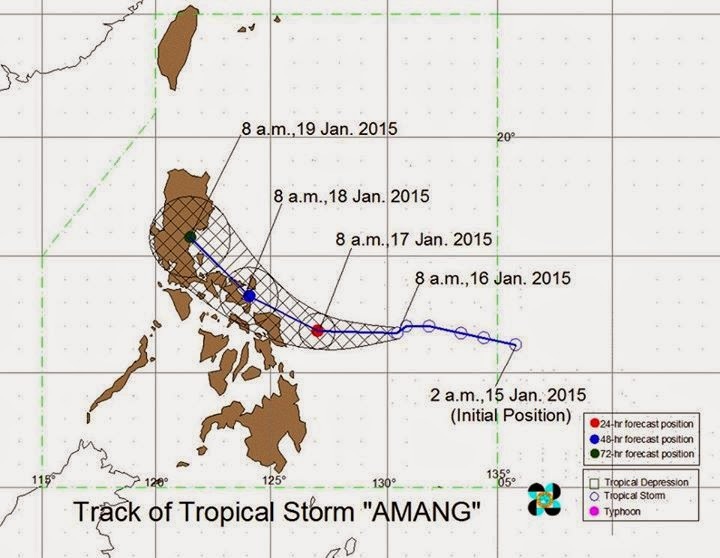 PAGASA issued their Jan.16 11AM weather bulletin that Bagyong Amang may hit Northern Samar tomorrow evening. PAGASA estimated the rainfall amount is from 7.5 – 20 mm per hour (heavy - intense) within the 300 km diameter of the Tropical Storm. According to weather agency, the center of Tropical Storm “AMANG” was estimated based on all available data at 560 km East of Borongan City, Eastern Samar (11.5°N, 130.5°E). Luzon: Camarines Sur, Catanduanes, Albay, Burias Island, Sorsogon and Masbate incl. Ticao Island. Visayas: Northern Samar, Eastern Samar, Samar, Biliran and Leyte. The positions of the Tropical Storm within 24 hour (Tomorrow morning): 180 km East of Borongan City, Eastern Samar. Then after 48 hour (Sunday morning): 40 km Northeast of Legazpi City. And on Monday morning: in the vicinity of Baler, Aurora. Meanwhile, PAGASA alerted all residents in low lying and mountainous areas of the provinces with PSWS#1 against possible flashfloods and landslides. Comments or suggestions about "Bagyong Amang Update January 16 - PAGASA" is important to us, you may share it by using the comment box below.